Net Ent has announced the imminent release of Secrets of Atlantis a couple of weeks ago. The software developer has produced so many quality slot machines, that expectations are always sky high. This new game invites players to explore an entirely different surrounding and get submerged beneath sea level. History buffs shouldn’t set their expectations too high. The game is not actually about solving the mysteries of the missing continent. There’s no secret that Net Entertainment’s latest installment has five reels, four rows and a total of 40 pay lines. It also runs smoothly on mobile devices, so fans of the genre can enjoy it on smartphones and tablets. The inherent trade-offs resulting from making the transition from desktops to a smaller display are not deal breakers. Secrets of Atlantis features rich graphics, with a lot of attention paid to the design of regular and special symbols. 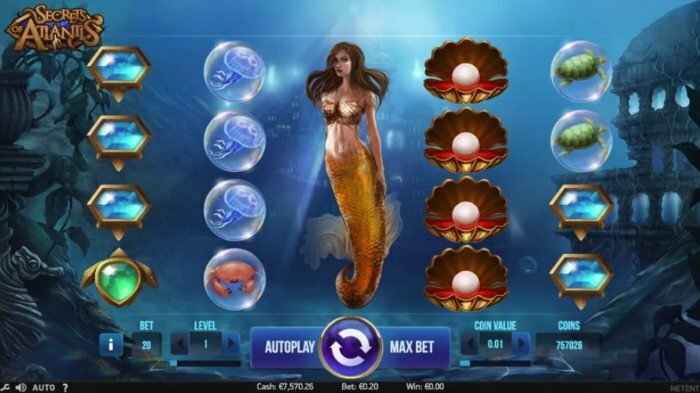 Spinning the reels of Secrets of Atlantis mobile slot for the first time is a treat to the eye. The colors are surprisingly warm for a game that takes place underwater. Not surprisingly, they revolve around different shades of blue and the reels are populated by symbols depicting maritime creatures. The mermaid stands out from the crowd and not necessary for the good reasons as she looks a bit rigid. The video slot creates the impression of slowly submerging. The landscape changes as if you were sinking from shallow waters to the depths. Players who have had the chance of enjoying other classic games, such as Starburst will surely love the gems. The eclectic mix of symbols goes beyond wildlife and creates a truly magical atmosphere. The return to player is well above average, with a ratio of more than 97%. This makes Secrets of Atlantis one of the best paying slots produced by Net Ent and other software developers. Action never seems to stop or even slow down on the five reels, thanks to the 40 pay lines. Stacked wilds have a two-pronged effect, as they create stunning visuals and enhance the winning combinations. In order to increase the investments 10 times or more, one would have to have the entire display featuring the same symbols. It is the free spins that keep players going and they are not in short supply at Secrets of Atlantis. As soon as the center reels are highlighted, free spins are triggered and this is when players can win the most. There is an indissoluble link between the profits they make and the stakes, with winnings of as much as 20 times the bet. Unlike other games which tend to bring all the reels to life when bonuses are triggered, this Net Entertainment creation is far more subtle. Spinning the reels of this slot machine feels like taking a leisurely swim with no worries whatsoever. A low house edge of less than 3% and little slot volatility makes Secrets of Atlantis a fine choice for beginners and amateurs. It is possible to bet as little as 0.01 coins and as much as a full coin, with the maximum win of 3200 times the bet. The bonus rounds are the ones that everyone is secretly hoping for and there are a total of three up for grabs. Colossal Symbols need to appear on the central three reels and highlight them with bubbles. When the bubbles cover all these reels, players receive a free respin. While waiting for this bonus rounds, players should know that Secrets of Atlantis slot pays from left to right and also right to left. The Mermaid stands for the wild symbol and is significantly larger than regular signs. To be more precise, it will cover the equivalent of four regular symbols. It has the uncanny ability of nudging up or down the reels, when it appears only partially. The upside is that this game mechanic allows for the wild symbol to cover the whole reel and substitute more low paying signs. 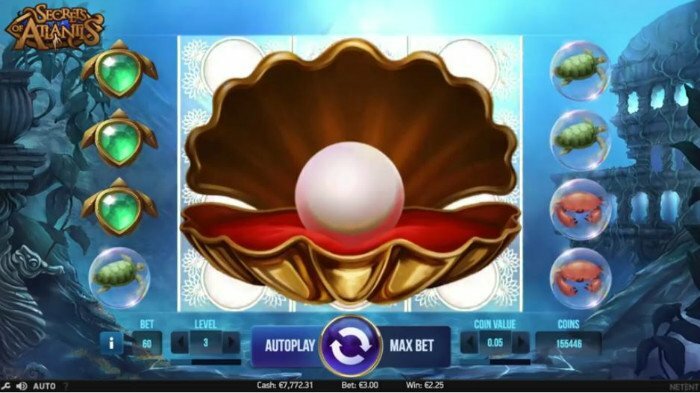 NetEnt’s Secrets of Atlantis is a great looking and well paying slot produced by Net Entertainment all the hype surrounding its release proved to be justified by this beautiful and lucrative game. The interesting mechanics and overall soothing atmosphere makes it the perfect choice for casual players. As with all games recently produced by the software developer, this one can be played on both desktop computers and mobile devices. The game bears many similarities to other classic titles released by the Scandinavian software developer in 2016. Its game mechanics are complex enough as to keep players interested but the learning curve is silky smooth. The absence of a jackpot might have a deterring effect on savvy players, but low volatility is a plus. The great in-game features and three distinct bonuses make it worthwhile spinning the reels. 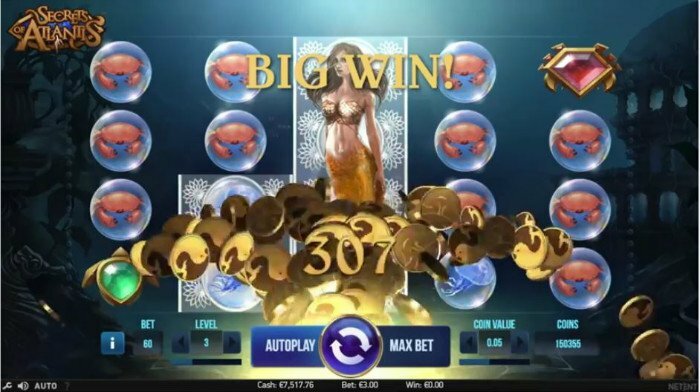 -Secrets of Atlantis has 40 pay lines and three in-game bonuses. -Great looking graphics, animations and low game volatility. -Secrets of Atlantis doesn’t feature any progressive jackpots. -Not the most original game produced by Net Entertainment.